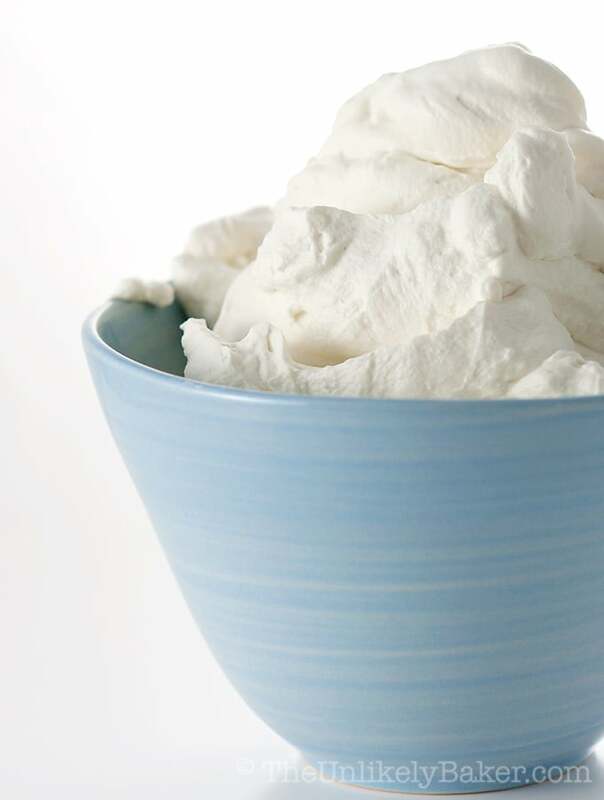 Homemade whipped cream tastes better than store-bought and is a breeze to make. 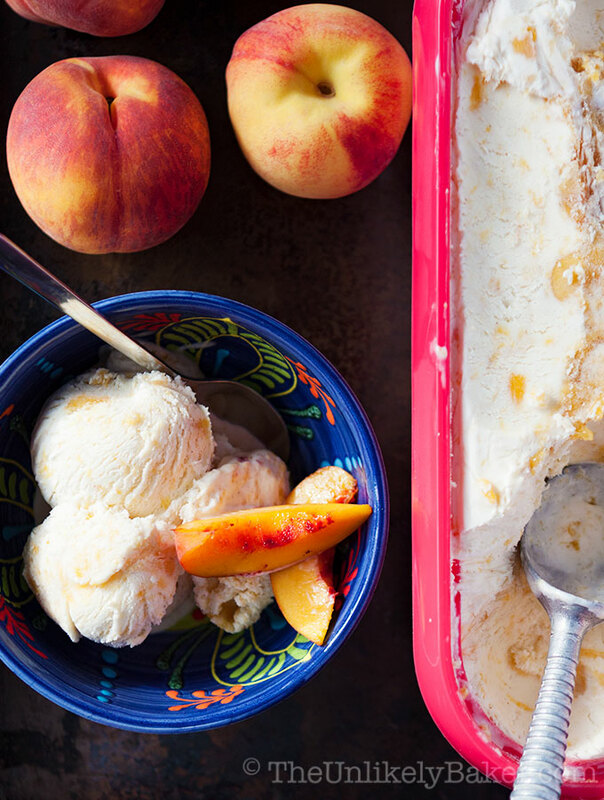 All you need is a bowl, an electric mixer and 15 minutes. Making fresh whipped cream is one of the very first things I learned as a home baker. It makes all desserts so pretty! Just have a look at this No Bake Mango Cheesecake and this Eggless Key Lime Pie. Homemade whipped cream tastes so much better than the packaged ones you buy at the grocery store too. Best of all, making it is quick and easy. All you need is a bowl, an electric mixer and 15 minutes. There’s absolutely nothing to it. Plus, read on for tips on storage, troubleshooting and perfect whipped cream every time. Chill not only your cream but also your bowl and your beaters. Do not over whip (it will turn the cream into butter). So it’s best not to walk away while the mixer is on. But if your cream has already become a bit too stiff (stiff, not butter), don’t worry because it’s very easy to fix. Just add a little cream and whisk until it becomes smooth again. Can you make whipped cream using milk? Another important thing to remember is you need a certain amount of milk fat content – usually 30% or higher – for cream to thicken properly. This means regular milk won’t work because its fat milk content just isn’t high enough. I always use heavy cream (usually 36% milk fat) but you can also use whipping cream and double cream (30% or higher). also whips wonderfully. 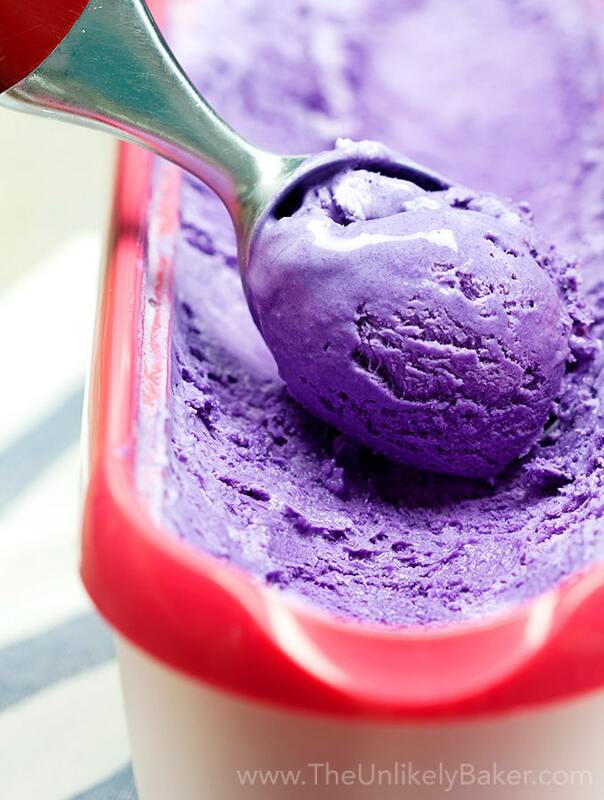 Check out this Ube Cheesecake and this No Bake Pineapple Coconut Cream Pie – I topped both with luxurious coconut whipped cream. Delicious! How long does homemade whipped cream last? 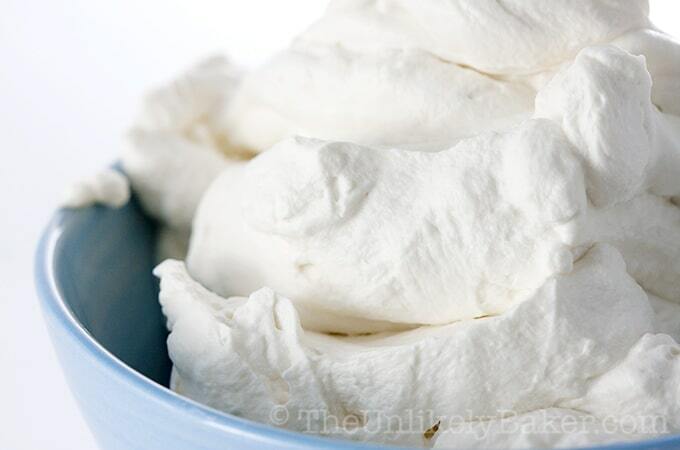 I’ve found homemade whipped cream can be made ahead too. 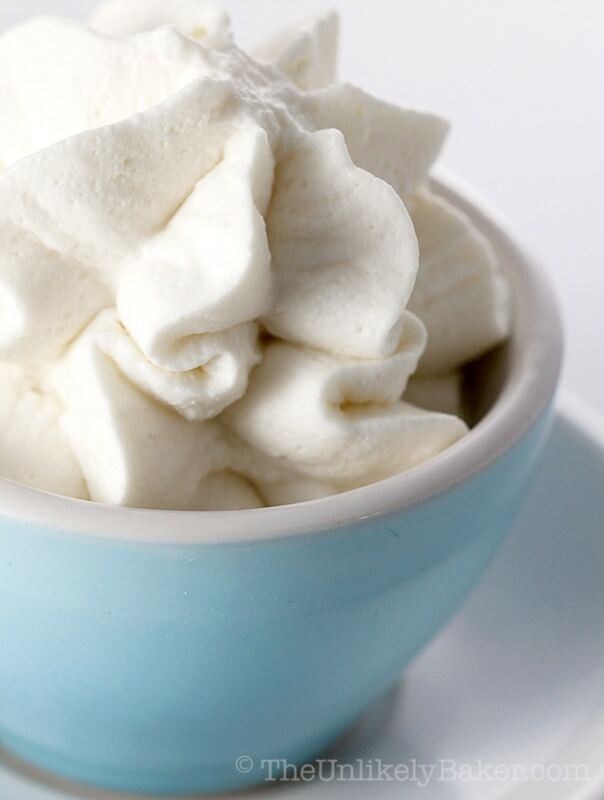 Don’t get me wrong – freshly whipped is still best but if you have company over you don’t really want to be stuck in the kitchen making whipped cream. What you can do is whip the cream to medium peaks a few hours before your guests arrive. Chill it in a bowl until you need it. Then whisk it to stiff peaks just when you’re ready to serve it. Can you make whipped cream days ahead? You can – it lasts 2-3 days in the fridge – though I don’t recommend it because it tends to break and liquify at the bottom. The better alternative is to freeze it. Can homemade whipped cream be frozen? Yes, you can freeze homemade whipped cream! It won’t be as shiny or fluffy as fresh but it’s still good. whipped cream onto a baking pan lined with parchment paper. I put my pan in the freezer (so make sure the pan you’re using fits your freezer). Once the individual pieces are frozen, I transfer them into a Ziploc bag or other freezer-friendly container. 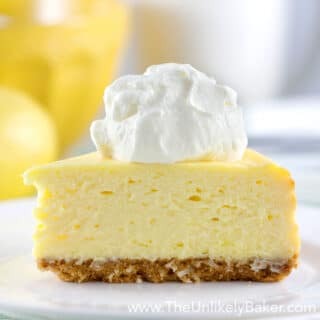 When you need them, just place the frozen pieces of whipped cream on top of your dessert and let it sit at room temperature for about 10-15 minutes before serving. But my favourite way to use them is to place a frozen piece of whipped cream on top of my hot chocolate and watch it slowly melt. Makes for one creamy and delicious drink! Frozen whipped cream lasts about 2 months. Whipped cream is not just for decoration. 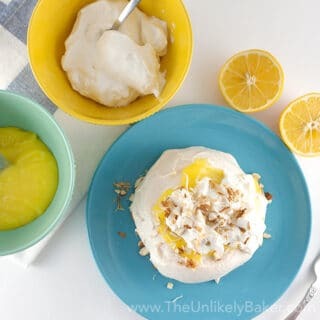 You can use it as frosting too (check out Chocolate Chiffon Cake with Whipped Cream Frosting and Mango Chiffon Cake with Whipped Mango Cream Frosting). You'll need a handheld electric mixer for this or a stand mixer with the whisk attachment. Whatever you're using, put the bowl and the whisk in the fridge for about 10 minutes before you start whipping so they are properly chilled too before you use them. Then just whisk all ingredients together - about 30 seconds on low speed to give them a good stir, switching to high speed until stiff peak (or until you reach the desired consistency you want - I use a stand mixer and it takes me about 2 minutes to get to soft peak stage, then another minute or so to stiff peak, which is what I want). Be careful not to overbeat though...you might end up with butter! 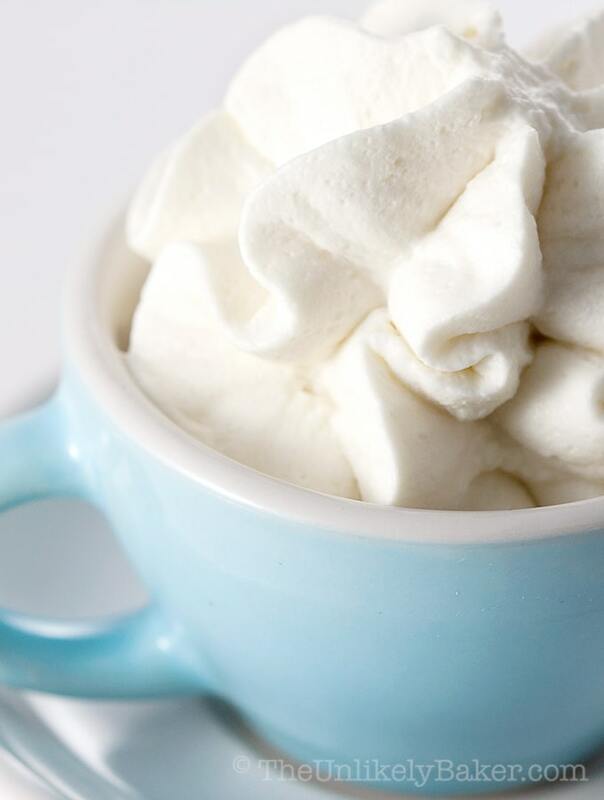 What’s your favourite way to use homemade whipped cream? I’d love to hear from you in the comments section below. There is nothing better than homemade whipped cream — in fact it’s easy to make stabilized whipped cream too. I love to frost cakes with whipped cream – so much better than the overly sweet frostings. You give some really great tips. Love making whipped cream at home. Nothing like fresh whipped cream. I can eat a whole bowl just as is.. Love the fresh flavor. So much you can do with it too. 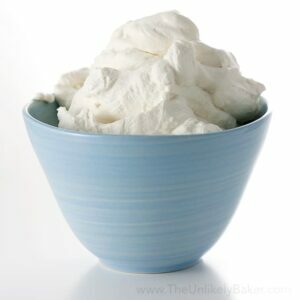 I love homemade whipped cream and have been making it for a while because it’s easy to make low carb. I love your videos! They are so pretty and fun! 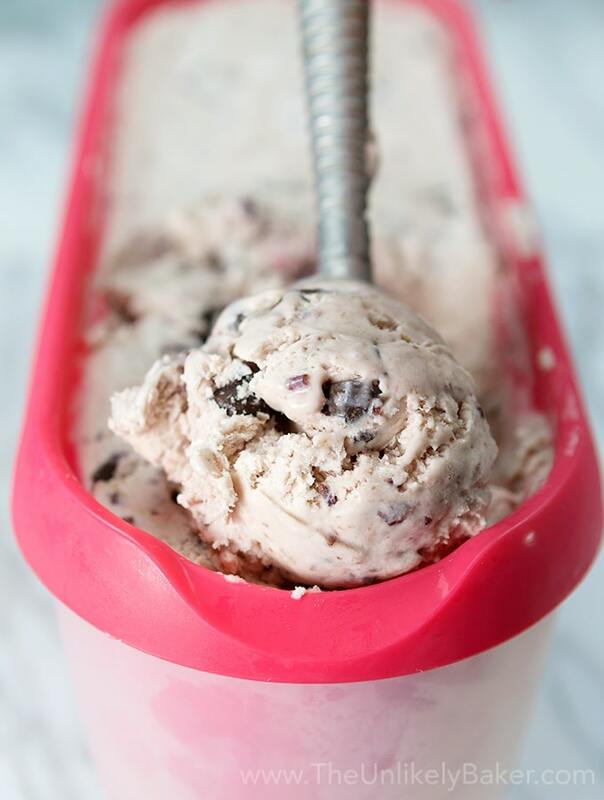 Homemade is so much better than the can or frozen topping. 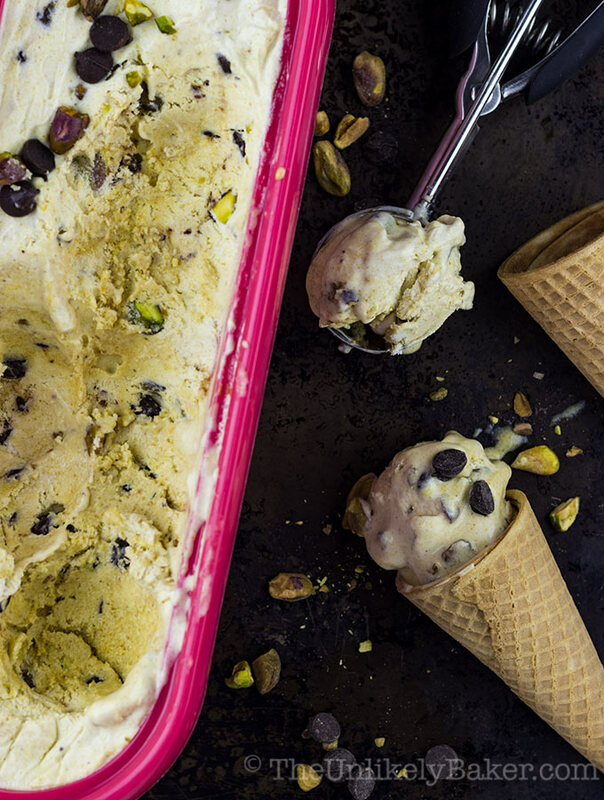 Easy to make, and you can flavour it too. Great post. Hi Gigi. I haven’t tried freezing it myself (we always eat them all lol!) 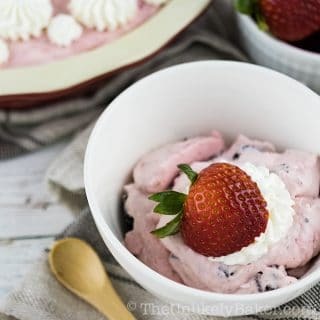 but here’s an article I found for you: http://www.simplyrecipes.com/recipes/how_to_freeze_whipped_cream/ Hope it helps! I’ve always made this. Easy as pie. Thank you. I sometimes vary different flavors for the vanilla, like Kahlua. It’s very good with a dollop in coffee. Hi Michele! Kahlua sounds delicious. I happen to have Kahlua too, will try it next 🙂 My favourite variation is lemon. How did I go this long buying store-bought?! 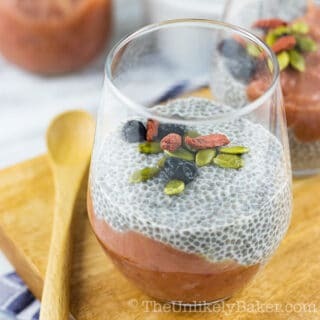 Such an easy recipe! I did add an extra tbsp of sugar to add a little more sweetness, but it’s delicious either way, yum!! That was what I thought too the first time I made this lol! 🙂 It’s so easy and tastes so much better right? Hope you like it! Thanks Jessica! Can this be made ahead an put in the fridg? I would like to make it for our waffles in the morning. Hi Amanda! Yes it can be made up to a day ahead and refrigerated although it might separate and become liquidy. It’s really best fresh. 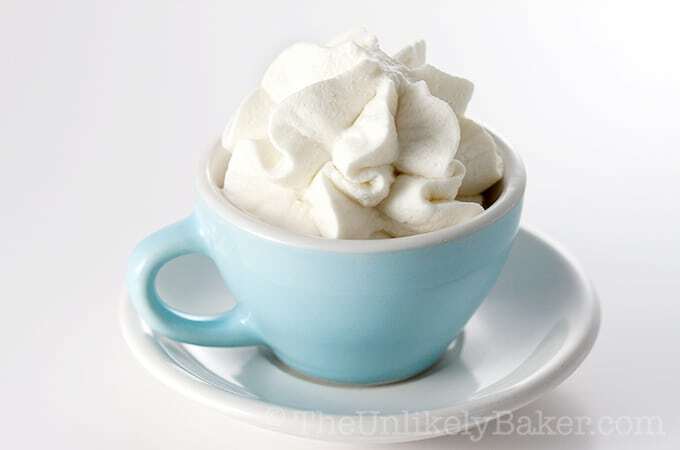 If you’re looking for a more stable whipped cream, see here: http://www.wikihow.com/Stabilize-Whipped-Cream. Hope it helps! WOW. I thought the recipe was going to be alot more complicated. But, it’s super easy. Yes it’s super easy I was surprised too! Now I don’t buy ready-made anymore 🙂 Homemade tastes so much better. Let me know how it goes. Thanks Charlene! Thanks for this! Great looking blog! 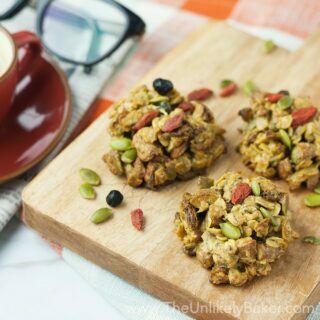 “why make it when you can buy it” to “I wonder if I can make that.” That happens on almost a daily basis and it sparks so many ideas and creative ways of trying to figure out a recipe. A true baker at heart for sure! Hi Caitlin! This is all new for me! I never would have thought I would have those thoughts 🙂 But it’s quite empowering. And not counting the recipe fails (let’s forget about them shall we? haha), learning how to do something at home is cheaper and often healthier. This looks so perfect! I’ve been wanting to make my own whipped cream. Thanks for the recipe! We make our own too and will never, ever go back to store bought! It’s amazing the difference! I love a great homemade whipped cream! Store bought just doesn’t cut it. The first time I made it though I overwhipped and my cream fell apart. But after that first failed attempt, my whipped cream was perfect every time. I’m sure it will taste great in different flavors too. Great read. As a cake decorator, I appreciated how you explain everything. So many people don’t explain it and people “attempt” it and it doesn’t work so they give up. You explain in great detail which should help a lot of home bakers! I believe someone above said what I was going to suggest. Confectioners sugar is what I use because it mixes easier. I am always running out of whip cream at home I don’t know why it never occurred to me to make my own. Thank you so much for sharing this. Absolutely 🙂 I find myself trying to make more and more things “homemade” precisely because I started paying attention to the ingredient list of things. And it’s cheaper too eh? I bought regular whipping cream and not the heavy. Will that work ok? I am making a strawberry shortcake on a trifle bowl and using angel food cake. Thanks! Hi Shirley! Yes you can use whipping cream. The only difference between the two is the fat content. Because whipping cream has less fat in it, your whipped cream will be a little softer, which I think will work perfectly for your trifle 🙂 Hope this helps. Let me know how it goes! Are there that many cooks who do not know how to make whipped cream? surprising. 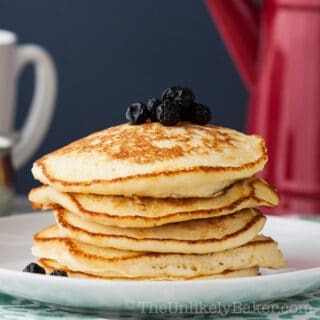 One suggestion: Use confectioners sugar instead of granulated. It mixes in much better. This is one of those simple things I could never get right. I’m not patient enough to wait for the peaks. I’ll try your way and use John’s confectioner’s sugar tip. Wish me luck! Thanks 🙂 Thanks for dropping by!